A regime change is gonna come ! I hope so. The Venezuelan people deserve a restoration of Democracy and freedom. Tell me, Neven : If Maduro still is as popular as you pretend him to be, why doesn't he allow free, UN supervised elections, just like what Bernie is asking for ? Looks a bit like Occupy Wall Street, doesn't it? Or the Gilets Jaunes. Any regime change in the US or France after that? Please post a similar picture from the US or France. And then please explain why you support the Venezuelan government, but not the US or France. Actually it was TRT who did that report. That's a Turkish news agency. So, is TRT saying that millions are starving in Venezuela, and do you automatically believe that? Is that YES to the first question, or the second ? Or both ? Yes to both. I know, I know, now you are going to find one article or news report by a mainstream media outlet that acknowledges that there are pro-Maduro rallies as well (bam, FACT, eat that, Neven). But go ahead, and compare how much attention pro-Maduro rallies get in mainstream media vs pro-Guaido rallies. Pompeo posted a photo of Guaido's rally with the caption: "The people of #Venezuela have again responded to @jguaido's call to take to the streets in support of freedom and democracy. Amazing... That sounds just like this from Rob Dekker: The Venezuelan people deserve a restoration of Democracy and freedom. I do not support the Venezuelan government per se. I'm against Trump and neoliberalism. Unlike you. I await your analysis of mainstream media coverage with bated breath. The Venezuelan people deserve a restoration of Democracy and freedom. But why do they "deserve" that Rob? It's their nation and they fucked it (apparently the US and the rest of the world had nothing to do with that), so surely they deserve a fucked up , impoverished country with no democracy, a violent fascist military junta, and an unelected president like they have in Qaido. They've had multiple elections, UN supervised and not UN supervised and look what that got them - Chavez, a new really DEMOCRATIC Constitution, poverty cut in half, proper medical care for the poor, but the rich hated it. So now all there is is chaos and humanitarian crisis that looks like a rich persons banquet next to Yemen. They got what they deserved, and more is coming their way! Ms Hausmann might even return "home" with her Papa real soon to give free comedy routines to cheer them all up and maybe even raise money for charity there to help them buy their "freedom"? If you want free and fair elections, you first need to lift the sanctions. Because now, what you are effectively saying, is: Vote for neoliberal stooge, or we will tighten the sanctions. How is that for election manipulation? Never mind all the social media manipulations that are most probably going on behind the scenes. If Russia and Cambridge Analytica can do it, so can the people who invented it (NSA, CIA, etc). Speaking of social media manipulation, I checked who posted that Joanna Hausmann video in this thread. That person must feel pretty stupid now, and if not, it's more than a feeling. It looks like many of our conversations diverge rather than converge to common understanding. That's why it's hard to respond to every issue raised. So let me respond only to what I feel are some core issues. I spent considerable time on my response to your position. And I responded to YOUR posts. And I talked about evidence-based reasoning. So how can that be 'propaganda' ? Why do you censor my posts, especially the good ones ? 1) There's an excessive focus on Venezuela because of resources and because 'socialism' needs to be annihilated. 2) Trump isn't resisted, he is helped. The biggest mistake that can be made, is acknowledge the narrative that is used to manufacture consent for chaos around the world that is highly profitable to a small group. That narrative needs to be fought tooth and nail. 3) If you want free and fair elections, you need to protest the crippling sanctions (if you're not already protesting them out of moral convictions). Venezuela is in trouble because, although oil profits have been used for social policies that have massively improved the lives of its population over the past two decades, they have failed at cutting their dependence on oil. They need to be helped with that, also for the sake of AGW. These are the core issues. Not to mention Venezuela is THE OPPOSITE of socialism. It's a dictatorship where a few privileged (especially the military) around the dictator take all the benefits, and the rest of the country is screwed. Neven, on this CORE issue, can you PLEASE understand that by stating that Venezuela has 'socialism' you are actively helping Trump and are actively working AGAINST Bernie Sanders ? Yes, Trump is helped by stating that Venezuela is 'socialist'. Venezuela is a failed state. Hyperinflation, economy in the tank, people starving, 3 million refugees, etc etc. And it will get worse now that the US decided to stop buying their oil. ANY attempt to deny the immense crisis, or to state that Venezuela is a 'socialist' country is another handout to Trump. Yes, Chavez' policies have significantly improved life for the poor in Venezuela. The problem is that he spend it all. He did not invest in the oil industry, and he did not save anything for a rainy day, like Norway did. In fact, he even borrowed money (from Russia and China mostly) to finance his policies, even while the price of oil went up. So, then when Maduro came along, and the price of oil declined, the country dipped into deep debt and never recovered. None of this has anything to do with the US, who was just buying Venezuelan oil until Jan 2019. So now the US stopped buying Venezuelan oil. That's the "crippling" sanctions that Neven says we need to be "protesting them out of moral convictions" as a pre-condition before "free and fair elections" are even allowed. In the news these days are several countries in crisis. When will Donald Trump, Rob Dekker and co be bringing these people the Freedom and Democracy they deserve? Don't they deserve some freedom from tyranny and democracy too? Gosh many of those countries even have extremely violent Islamists like ISIS Al Queda Terrorists running the place. Check out the better places 155-178 and maybe reconsider how "good" you got it. oh yes, Venezuela is on a par with the Philippines ... so when will the US Empire's Regime Change and liberation invasion for Democracy be happening in Manilla? Yes, and it makes perfect sense. I can't help it that your brain starts to malfunction as soon as you hear the 'dictator' dog whistle. Rob, if the next step in your strategy is to fight Trump by saying Chavismo isn't socialist, you are going to be totally destroyed by Trump and Fox et al. I know you are a perfect reflection of mainstream, establishment, neoliberal thinking, but I sincerely hope this is your own idea and not something that Democrats are going to try, let alone Sanders. "Since 2006, U.S. officials have expressed concerns about Venezuela’s lack of cooperation on anti-terrorism efforts. Since then, the Secretary of State has made an annual determination that Venezuela is not “cooperating fully with United States anti-terrorism efforts” the United States has prohibited all U.S. commercial arms sales and retransfers to Venezuela since 2006." Now that's funny. World's foremost terrorist accuses Venezuela of terrorism. "In 2008, the Treasury Department imposed sanctions (asset freezing and prohibitions on transactions) on two individuals and two travel agencies in Venezuela for providing financial support to the radical Lebanon-based Islamic Shiite group Hezbollah." "Since then, the President has made an annual determination, pursuant to procedures set forth in the Foreign Relations Authorization Act, FY2003 (P.L. 107-228, §706; 22 U.S.C. 2291j), that Venezuela has failed demonstrably to adhere to its obligations under international narcotics agreements. President Trump made the most recent determination for FY2019 in September 2018, but also waived foreign aid restrictions for programs to support democracy promotion." Great. We ought to see Sackler in jail soon ? "economic sanctions on at least 22 individuals with connections to Venezuela and 27 companies by designating them as Specially Designated Narcotics Traffickers"
". Tier 3 countries are those whose governments do not fully comply with the minimum standards of the Trafficking Victims Protection Act ... they are subject to a variety of U.S. aid restrictions, which may be waived by the President for national interest reasons." Minimum standards apparently allow rendition and Guantanamo.
" 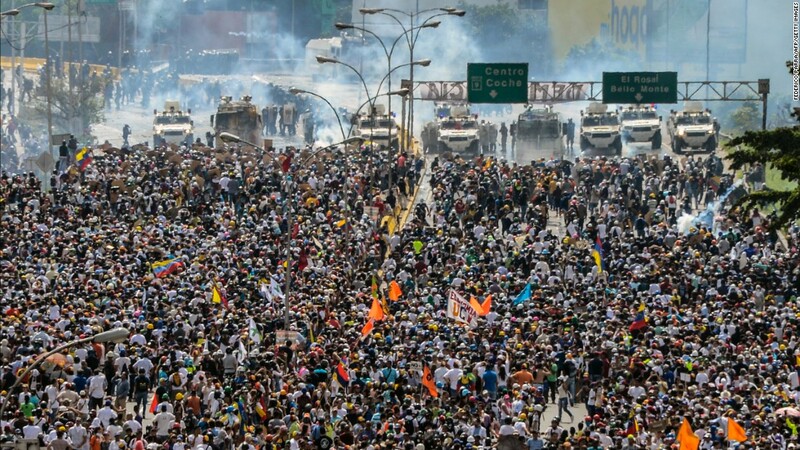 Congress enacted the Venezuela Defense of Human Rights and Civil Society Act of 2014... the law requires the President to impose sanctions (asset blocking and visa restrictions) against those whom the President determines are responsible for significant acts of violence or serious human rights abuses associated with February 2014 protest"
involved in actions or policies undermining democratic processes or institutions; those involved in acts of violence or conduct constituting a serious human rights abuse; those taking actions that prohibit, limit, or penalize the exercise of freedom of expression or peaceful assembly; public corruption by senior Venezuelan officials; and any person determined to be a current or former leader of any entity engaged in any activity described above or a current or former official of the government of Venezuela." "the Treasury Department has imposed financial sanctions on 80 Venezuelans pursuant to E.O. 13692." "On January 8, 2019, pursuant to E.O. 13850, the Trump Administration sanctioned 7 individuals and 23 companies for involvement in a corruption scheme involving Venezuela’s currency exchange practices"
"On January 28, 2019, pursuant to E.O. 13850, the Treasury Department’s Office of Foreign Assets Control (OFAC) designated PdVSA as operating in the oil sector of the Venezuelan economy and Secretary of the Treasury Steven Mnuchin determined that the company was subject to U.S. sanctions. As a result, all property and interests in property of PdVSA subject to U.S. jurisdiction are blocked, and U.S. persons generally are prohibited from engaging in transactions with the company." "In August 2017, President Trump issued E.O. 13808, which prohibits access to the U.S. ... prohibits access to US financial markets by the Venezuelan government, including PdVSA ... "
"In March 2018, President Trump issued E.O. 13827, which prohibits transactions involving the Venezuelan government’s issuance and use of digital currency, digital coin, or digital token." "In May 2018, President Trump issued E.O. 13835, which prohibits transactions related to the purchase of Venezuelan debt, including accounts receivable, and to any debt owed to Venezuela pledged as collateral." There is a reason why Bernie and AOC avoid talking about Venezuela, and NO, it's not because America is evil. It's because Venezuela is fucked up. The reason is that they need the votes of brainwashed people like you. I think you represent a large segment of the American population that thinks it's liberal/progressive, but has been brainwashed to be right-wing. And you say they avoid talking about it, which might also mean they are not mindlessly repeating your FACTS, and you don't want to post what they're saying (just like you selectively quoted that letter by Ro Khanna). Either way, whatever it is they say, they need to do it in a way that resists the warmongering regime change narrative and that resists Trump ('He said he didn't want any more meddling and toppling, and here he is talking about a military intervention in Venezuela! The troops are still in Syria and Afghanistan, which isn't what he promised, and his cabinet of war criminals like Pompeo and Bolton, would love nothing more than a hot war with Iran! Trump says he's an outsider, but he is part of the swamp, trying to make money off of workers and poor people, no matter if they're brown, black or white, foreign or American!'). Where was America when they needed them the last 30 years of fucked-uped-ness? Oh what's that? President gets ousted without US Sanctions or Regime Change invasions? Wow. That can't happen ... people solving their own internal problems without the genius of Trump, Bolton and Pompeo to held them. Jeezus what's the world coming to? What will the USA be doing about all those "deaths" in clashes? There have been unconfirmed reports that the Venezuelan government has removed around 30 tons of gold from central bank vaults this year. Washington and the government’s opposition have accused Caracas of trying to sell national gold reserves abroad. The US has threatened sanctions against any company attempting to buy Venezuelan gold. I smell the sweet scent of liberation in the air. The Venezuelan ex-Major General, whose nickname "el Pollo" means "the Chicken," is accused of protecting a Colombian drug kingpin from arrest, allowing him to move about 5,600kg of cocaine in and out of Venezuela, and tipping him off to law enforcement activities. Carvajal allegedly was not only paid off by the kingpin and other members of his organization, but also invested in some of the drug shipments. He is also accused of providing weapons to the Revolutionary Armed Forces of Colombia (FARC). While Carvajal served as chief of military intelligence and counter-intelligence under former Venezuelan President Hugo Chavez, he reportedly began to distance himself from Chavez's successor President Nicolas Maduro after returning to Venezuela in 2014 from Aruba, where he had been briefly detained on the same US warrant, facing extradition until Maduro threatened retaliation against the island. Carvajal left Maduro's government in 2017, ostensibly in protest over Maduro's plans to form a constitutional assembly that would reduce the power of the opposition-controlled National Assembly, and declared his allegiance to opposition leader and self-appointed president Juan Guaido in February, blaming Maduro for the "disastrous reality" of Venezuela. Last month, the president expelled Carvajal from the armed forces, accusing him of "acts of treason against the fatherland." Since embracing the US-backed Guaido, Carvajal has called on other members of the Venezuelan military to join the opposition, warning them against becoming "collaborators" of a "dictatorial government that has plagued people with misery" and accusing military leaders of being pawns of Cuba. He also gave a juicy interview with the New York Times, denouncing current and former members of Maduro's government as drug traffickers, FARC and Hezbollah collaborators, and journalist blackmailers while denying his own guilt on the many of the same charges. The US has already confiscated much of Venezuela’s gold and oil industry assets, seeking to effect regime change in Caracas and depose President Nicolas Maduro in favor of US-backed opposition leader Juan Guaido. Man, you live in a parallel universe. Oil profits for the advance of social policies in the last 20 years? But you are not an idiot... are you being subsidized by some entity friendly to Maduro and don’t want to bite the hand that feeds you? And why the censoring to Rob Dekker and in this thread in “a forgotten corner of the galaxy”? Well this is your platform from which, I must say, you speak with the sanctimonious and judgmental tone of the far left. When you condescend to us to speak about Arctic I listen, here I just know you are sooo far from truth. A key belief of Chavismo is that the state should support social welfare programs for its citizens. For instance, Chavez often used populist rhetoric to galvanize the lower classes and the disenfranchised with promises to make their lives better. Revenue from Venezuela’s significant oil reserves were put into programs designed to reduce poverty, improve education, and establish social justice and social welfare within Venezuela. A video I posted earlier from The Real News Network has some of the numbers on poverty, education, child mortality, housing, etc, I believe. The video also argues that Chavez had failed to wean the Venezuelan economy off of oil. So, the improvement for the majority of the Venezuelan people has taken place, but it was built on shaky foundations, especially if a terrorist organisation like the USA has decided to launch a (c)overt regime change operation. Do you have any more videos from hip, privileged YouTubers who fail to mention that their daddies are neoliberal economists, who are pushing for a return to white class feudalism in Venezuela? Meeting was on April 10 at 3 PM. According to Reuters, US sanctions have removed 800,000 bpd of heavy crude from the global market, leaving refiners scrambling for alternatives in a limited pool that, besides Russia and Middle Eastern producers, also includes Canada and Mexico as large producers of these grades of crude. Canada is having its own problems with a pipeline capacity shortage and a production cut that has boosted prices [ and so Canada heavy grade still not getting to the Koch refineries in Texas that were using Venezuelan crude until 2019 ], and Mexico has yet to reverse a fall in oil production. "US has again hit shipping companies doing business with Venezuela"
"four shipping companies and nine vessels"
"Jennifer Navigation Ltd (Liberia), Lime Shipping Corp (Liberia), Large Range Ltd (Liberia), and PB Tankers S.P.A. (Italy)." "all property and interests in property of these entities, and of any entities that are owned, directly or indirectly, 50 percent or more by the designated entities, that are in the United States or in the possession or control of U.S. persons are blocked"
"Venezuela was still shipping crude oil to ally Cuba in the amount of 1 million barrels just days after the US levied sanctions on Venezuela-to-Cuba oil shipments "
"Members of a counterintelligence unit known as la Sombra—“the Shadow”—sent by the embattled Maduro regime. " "Mercenaries and ex-Venezuelan officers plotting their next move." "Sergei Skripal, a former double agent working for MI6, was sent to help the Colombians figure out what to do about the growing Russian presence." "The U.S. isn’t yielding the playing field: Its Bogotá mission, one of the largest in the world, has 3,000 employees." "Colombia recognized Guaidó as Venezuela’s president and revoked diplomatic status for Maduro’s representatives. " "ex-Venezuelan military who camp in Bogotá to plot coups d’état. " "The Colombian authorities despise Maduro and are eager to see him driven from power. But the presence of armed agents makes them nervous. " "authorities have caught and deported a handful of alleged Maduro-sent infiltrators. "